Industrial grade coated cloth tape. Perfectly suited for A/V, TV, photography, theatrical and motion picture industries to bundle wires, color-code, and tape down lighting and props. Also used for book-binding and masking silk-screen frames. Values obtained from tests do not represent a guarantee of product performance. Individual rolls may vary slightly from these averages. 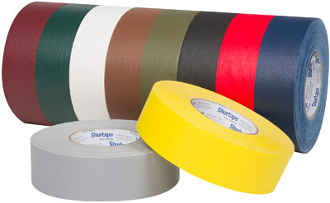 Shurtape recommends the user to determine whether the product is fit for a particular purpose and is suitable for the user's method of application.